Tata Motors has finally showcased the nearly ready for production version of its upcoming compact sedan at the 2016 Auto Expo. The Tata Kite 5, which is its concept name and will be changed once launched, shares a lot with the Zica hatchback. Based on the same platform as the Zica, the front face of the Kite 5 looks similar to the Zica. It is the side which gives it a distinct appeal. The sloping coupéish roofline, strong shoulder line and 15-inch sporty alloys make it look impressive. The profile which will definitely strike a chord has to be the rear as it clearly draws inspiration from new age Jaguars. We believe that the Tata Kite 5 will have a similar interior layout as the hatchback. The Tata Kite 5 gets a longer wheelbase, by about 50mm which also translates to a better legroom inside. 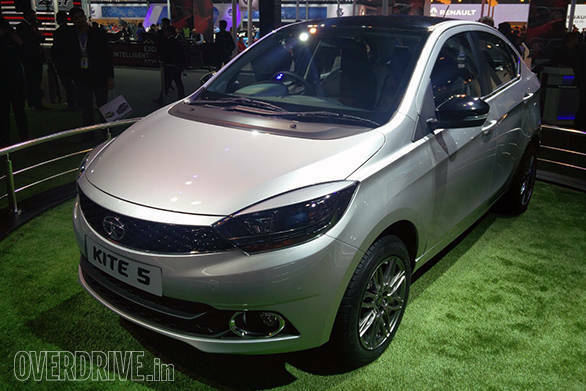 The features and options in the Tata Kite 5, again will be derived from the hatchback. The engine options that will come in the Kite5 include the 1.2 petrol and 1.5 diesel units. The petrol makes 85PS/ 114Nm. It will be mated with an automatic transmission as well. 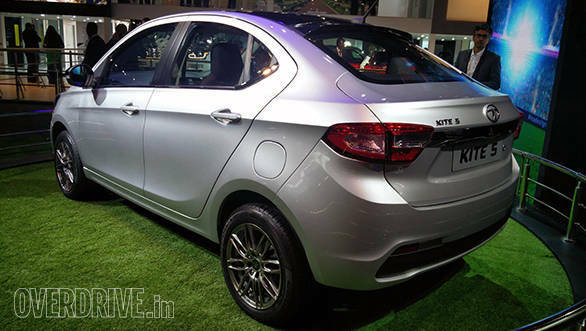 The pricing of the Kite 5 might be Lower than the existing Zest sedan. More details will surface at the time of launch of Kite5 which happens later this year.